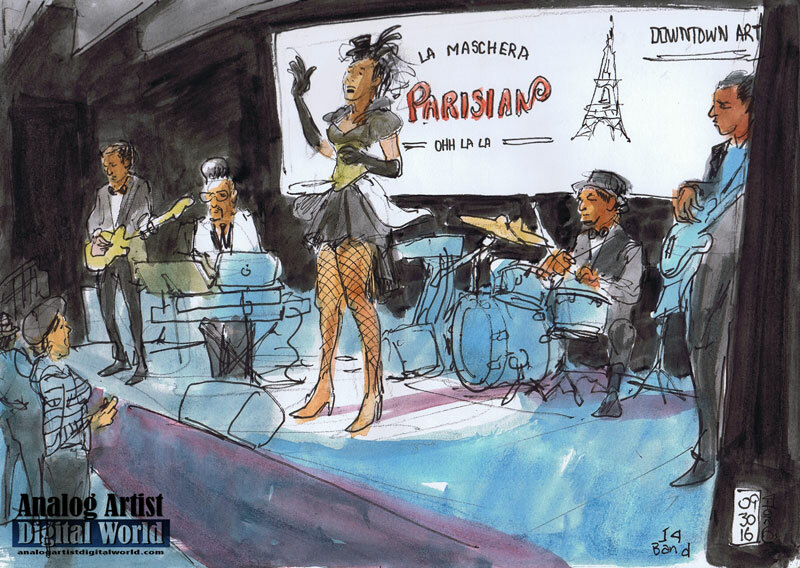 Analog Artist Digital World: The I-4 Band at La Maschera Parisian. The I-4 Band at La Maschera Parisian. The Downtown Arts District hosted a fundraising event at The Abbey (100 S Eola Dr #100, Orlando, FL 32801). Patrons enjoyed a journey back to Paris in the 1890s, when impressionist artistist Henri de Toulouse-Lautrec created his most famous works of art. The birthplace of modern can-can dance, the Montmartre neighborhood is the symbol of creativity, pleasure, beauty, and celebration. The I-4 Band was performing on stage when I arrived, so I set up immediately to sketch. The lead singer had on a gorgeous black dress that was quite reminiscent of the can-can era. Guests did a great job of dressing up in their Parisian best. I did a second sketch near the bar and was considering a third sketch of the dance floor, when friends invited me to their table. It is sometimes frustrating to only have time to do one or two sketches, when this event clearly had inspiration for dozens of them. It is important to learn, however, that sometimes it is nice to let go and just enjoy the moment. Sing Along with The Muppet Movie at the Abbey. Science of Wine at the Science Center. Absinthe Jazz Trio at Lil Indies. Weekend Top 6 Picks for August 26 and 27. Passion PR Five-Year Anniversary Bash. Mike Perkins presented a Collective Narrative. Art After Dark at the Copper Rocket.. Living Room Screening - Short Film Program. Weekend Top 6 Picks for August 19th and 20th. Do Good Date Night at Second Harvest. The Merry Widow at the Rep. Weekend Top 6 Picks for August 12th and 13th. The Great Florida Road Trip Tacky Tourist Party. Weekend Top 6 Picks for August 5th and 6th. Artlando in Lock Haven Park.